Stone likely to roll out of Ottawa as free-agent gem in July - The Point Data-driven hockey storytelling that gets right to the point. 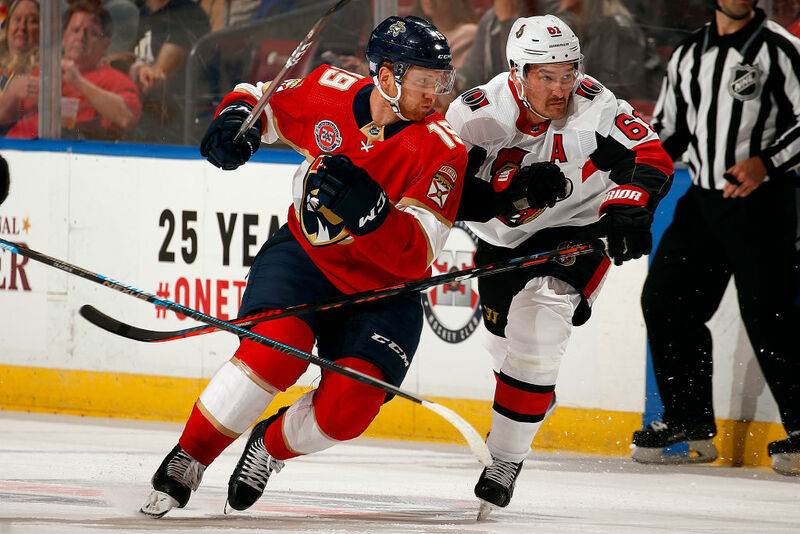 The way things have gone for the Ottawa Senators over the last year, it’s become almost difficult to watch; like a car crash in slow motion as the team traded away two of its stars for pennies on the dollar this summer. It’s one thing to enter a rebuild, but the acrimony between the Senators and their small group of legitimately great players that made up the core of their team over the last several years has been palpable, with public barbs being tossed at Erik Karlsson and Mike Hoffman, not to mention the drama between those two players and their wives. Between poorly thought out interviews between depth defenceman Mark Borowiecki and Eugene Melnyk, to leaked dash camera video from an Uber in Arizona, the controversies haven’t stopped for the Sens, and that’s not even the most important problem they’re facing. After failing to reach a long-term agreement in the offseason, come July 1st Winnipeg’s own Mark Stone will be an unrestricted free agent, and there’s little reason to think the Senators’ plummet to the bottom of the standings in the Eastern Conference with no first round pick this year is giving him much incentive to re-sign. In a potentially star-studded free agent class in the upcoming summer of 2019, Stone will likely be one of the most sought-after players on the market, right up there with Artemi Panarin and former teammate Erik Karlsson if he isn’t extended by San Jose. Stone is one of the better offensive wingers in the game, and in his prime years now, he’s put up an excellent 88 points over this season and last season, which just so happens to be 82 games played for him. Just to put that in context, it’s the same points per game rate as Auston Matthews, Evgeny Kuznetsov, and Johnny Gaudreau. Those are some of the best offensive players in the NHL, and yet Stone has sort of flown under the radar on a team that doesn’t really play pretty hockey and gets more attention for its failures in management than what they do on the ice. His offensive production alone makes him a star calibre player, but offence isn’t his strongest attribute. 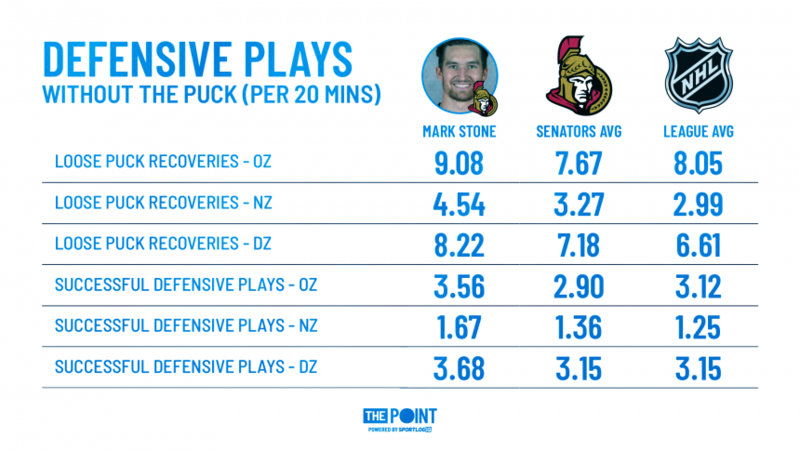 Where Mark Stone truly excels in hockey is playing without the puck. You’ve probably heard that Stone is one of the best players in the league at ‘takeaways’, which is a statistic the NHL tracks on a somewhat dubious basis, though they seem to be on the right track with Stone. Since the 2014-15 season the NHL has credited Stone with 411 takeaways, the most in the NHL and nearly 100 more than the player with the next most; Jeff Skinner at 317. Stone has said before in interviews that he likes to line players up for hits, and as soon as they brace for the incoming hit, he bails on it and goes for the puck, essentially freezing puck carriers for steals, and watching him for a short length of time you can see how effective he is at pulling this move off. I can’t speak to the efficacy of the NHL’s tracking of the statistic, as their so-called “real-time stats” are notoriously bad, but what I can do is look at what Stone does without the puck compared to his peers, and it’s obvious right away that he’s elite. It’s not a perfect picture because it includes centres, who are far more active defensively than wingers are, but you can clearly see that Stone excellent at both recovering loose pucks to gain possession for his team, and removing possession from opponents with successful defensive plays like stick checks, body checks, and pass blocks in all three zones. For the last three straight seasons before this one, Stone has led all wingers in the NHL in both loose puck recoveries and successful defensive plays, making him the most disruptive defensive winger in the NHL. For comparison’s sake in order to put this in context, the centre who has led the NHL in these statistics since 2015-16 is Patrice Bergeron, who is the consensus best defensive forward in the NHL, so while Stone cannot have the same defensive impact from the wing as Bergeron does from the middle, keep in mind that his impact relative to his peers is about the same as Bergeron’s, which says a lot. It isn’t just that Stone is a hyper-aggressive defensive player either; he boasts some of the highest puck battle success rates in the league, especially in the neutral zone. Puck battles have three possible outcomes, either player could win it, or both of them could fail to recover the puck, so win rates are often lower than you would expect. The average NHL forward wins just 37 percent of their neutral zone puck battles, while Stone wins 68 percent of his, an astonishing number. Add to all of this that he’s led all Senators forwards in transition plays this season, moving the puck up the ice with 19.8 plays per 20 minutes at 5-vs-5, and you have an elite level three-zone player with no inherent weaknesses, which means when the calendar gets to July 1st, 31 teams should be lighting up his agent’s phone.